Our Flexible Focus Extension shafts can be shared between multiple enlargers by simply fitting an adapter knob to each of the enlargers. The extension shaft can then be attached or removed instantly. 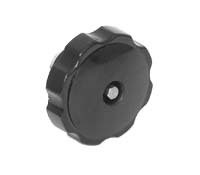 This adapter knob fits the focus shaft on Omega D-5, D-6 4x5, and Super Chromega E Dichroic 5x7 enlargers. Knobs for other models of Omega and Beseler enlargers are also available - see "Related Products" below.